Australian territorial claim (red area). Ex officio as Governor-General of Australia. These regions are split into two separate areas geographically, with George V Land and Oates Land lying to the east of the French Territorial claim of Adélie Land, and all other districts lying to its west. Australia claims an exclusive economic zone (EEZ) from the Australian Antarctic Territory. However, the Australian proclamation of an Antarctic EEZ is contested. The effect of Article IV of the 1959 Antarctic Treaty (which prohibits new territorial claims or the extension of existing claims in the Antarctic) would seem to be that an EEZ cannot be claimed in relation to territory to which that Treaty applies (south of 60° South). The provisions of the United Nations Convention on the Law of the Sea (UNCLOS) define the exclusive economic zone of a coastal state as up to 200 nautical miles (370 km) from the baseline from which the territorial sea is measured. Whaling in Australian Antarctic territorial waters is controversial and has received international attention. Anti-whaling protest groups, in particular Sea Shepherd Conservation Society, have been active within the Australian Antarctic territorial waters. Sea Shepherd small boat crews have had multiple encounters with Japanese ships that claim to be on research expeditions while opponents argue this is only a "cover" for banned commercial whaling. The Australian Whale Sanctuary, in Australian Antarctic territory, is not recognised by the government of Japan. Anti-whaling legislation passed by the Australian Government applies to Australian territorial waters. However, Australia's claims of sovereignty over the Australian Antarctic Territory—and thus sovereignty over Australian Antarctic territorial waters—are recognised by only the United Kingdom, New Zealand, France and Norway. The United Kingdom first claimed Victoria Land on 9 January 1841 and then claimed Enderby Land in 1930. In 1933, a British imperial order transferred most of the territory south of 60° S and between meridians 160° E and 45° E to Australia. That part of His Majesty's dominions in the Antarctic Seas which comprises all the islands and territories other than Adélie Land which are situated south of the 60th degree of South Latitude and lying between the 160th degree of East Longitude and the 45th degree of East Longitude is hereby placed under the authority of the Commonwealth of Australia. The borders with Adélie Land were fixed definitively in 1938. In 1947, Britain transferred Heard Island and McDonald Islands to the territory. On 13 February 1954, Mawson Station was established as the first Australian station on the continent proper. Australia's claim to sovereignty over the Australian Antarctic Territory is recognised by the United Kingdom, New Zealand, France and Norway. Japan does not recognise the Australian claim to the Australian Antarctic territorial waters in which Japanese ships conduct whaling. During the early 1980s there was a brief debate in Australia on whether or not to allow mining on the mineral-rich continent. Several mining proposals have been discussed and have all been rejected. On the 9 August 2011, influential Australian think-tank, the Lowy Institute, published a report warning Canberra against complacency when it comes to its claim. The global treaty banning resource exploitation becomes reviewable in 2041, and some states may then decide to withdraw from it considering the continent's mineral deposits. These include coal seams, manganese, iron and uranium, while Antarctica's forecast oil reserves are estimated as among the largest in the world after Saudi Arabia and Venezuela. Lowy's national security fellow Ellie Fogarty said in the paper that Australia cannot adequately patrol its claim, lacking the kind of ski-planes it needs to reach some areas. It also lacks an ice-breaking ship in the region. Australia issues postage stamps for the Australian Antarctic Territory. The first issues came in 1957, and sporadically thereafter, settling into a pattern of an annual issue by the 1990s. 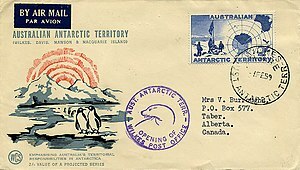 All have been Antarctic-themed, and all are valid for postage in Australia and its territories, including Antarctica. Assigned the country calling code +672 1[0-4] XXXX, the four stations and the Aurora Australis operated by the Australian Antarctic Division can be reached by direct calling from anywhere in the world. The area codes are 10 for Davis, 11 for Mawson, 12 for Casey, 13 for Macquarie Island and 14 for Wilkins and the Aurora Australis, in each case followed by four additional digits. As of the December Quarter of 2016 the AAT was believed to have a population of 57 people. ^ "National recovery plan for Albatrosses and Giant-petrels: Section 4.1.6 Australian Antarctic Territory, Geography". Australian Government, Department of the Environment, Water, Heritage and the Arts. Archived from the original on 17 August 2008. Retrieved 16 July 2008. ^ "Part V. Exclusive Economic Zone. Article 57. Breadth of the exclusive economic zone". United Nations Convention on the Law of the Sea. Retrieved 15 January 2018. ^ a b "Japanese whalers told to keep out of Australian territory". The New Zealand Herald. 16 January 2008. Retrieved 17 September 2011. ^ "A Brief History of Mawson". Australian Government – Australian Arctic Division. Archived from the original on 27 July 2008. Retrieved 16 July 2008. ^ "Chapter 6: Antarctic Territories" (PDF). Parliament of Australia. Archived from the original (PDF) on 26 June 2008. Retrieved 2013-03-29. ^ Humane Society International Inc v Kyodo Senpaku Kaisha Ltd  FCA 3 at , (2008) 165 FCR 510 (15 January 2008), Federal Court (Australia). ^ "Mining". In the 1980s the question of possible mineral exploitation (including the hydrocarbons oil and gas) was addressed by the nations of the Antarctic Treaty. They negotiated an agreement called the Convention on the Regulation of Antarctic Mineral Resource Activities (CRAMRA) which would have regulated mining should it have ever been contemplated. CRAMRA did not come into force. Instead, the Madrid Protocol was negotiated and it includes a ban on Antarctic mining. Australian Government. Retrieved 26 June 2013. ^ "No mining in Antarctica, say Aussies". Despite the current global appetite for minerals, which has underpinned two decades of economic growth in Australia, the country currently has no plans to allow any mining in Antarctica. IOL. Retrieved 26 June 2013. ^ "Antarctica: Assessing and Protecting Australia's National Interests" (PDF). International interest in Antarctica is rising. Lowy Institute. Retrieved 26 June 2013. ^ Swan, Robert. "2041". In the year 2041 the Protocol on Environmental Protection to the Antarctic Treaty could potentially be modified or amended. 2041.com. Retrieved 26 June 2013. ^ corporateName=Australian Electoral Commission; address=50 Marcus Clarke Street, Canberra ACT 2600; contact=13 23 26. "Determination of membership entitlement to the House of Representatives". Australian Electoral Commission. Retrieved 19 April 2019.